Duckhorn Wine Company’s Migration has earned acclaim for a refined and compelling style of winemaking that seamlessly balances vibrancy and finesse. Migration is dedicated to crafting wines from the finest cool-climate winegrowing regions highlighting lush fruit, bright acidity and impeccably balanced oak. Since 1982, Charles Heintz Vineyard in Green Valley has emerged as a legendary site for world-class Chardonnay. Located atop the second ridge inland from the Pacific at an elevation of 900 feet, Heintz is a warmer vineyard in a very cool winegrowing region. 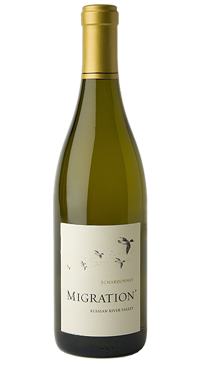 This unique combination creates a gracefully balanced wine that combines the richness and intensity of perfectly ripened old vine fruit with the structure and acidity of great Sonoma Coast winegrowing.